Cyclocosmia is a relatively new project that I have had the pleasure of working on in the past. I call it a project rather than a band, because Cyclocosmia embodies a real commune approach to music making. One the band members is – in fact – a filmmaker, and an open invite on their website encourages any fans to contribute and submit material for future projects. 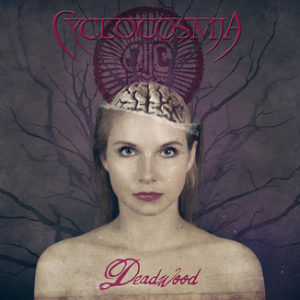 Cyclocosmia’s debut album, Deadwood, features 10 tracks of mostly symphonic metal, with numerous gorgeous interludes of a minimalist approach. The album is about the darker side of the human mind, and the title refers to the parts of the mind that are not working as they should and impair the function of the mind as a whole. “Shackled” is another track that stands out as lyrically significant, with lines describing the non-anguished anguish of a walking shell of a person, simultaneously in pain and unable to feel that pain. “…y dolor en la Tierra” is, as the title implies, a song written in Spanish about singer Lorena’s native country of Venezula. Living in Spain and being a Spanish speaker myself, this song grabbed my attention as one would expect. The lyrics are beautiful, and I cannot envisage them better in any other language. The album ends with “Under the Silent Stars,” which is – in my opinion – the most poignant track on the album. Maybe it’s the attractive minor key? Maybe it’s because it’s minimalist by comparison? (In contrast to most of the album, this track does not feature a symphonic metal interlude). Maybe it’s because of the nautical references? Maybe it’s because it is about death? In any case, it is a memorable song to end a debut album and by far my favourite on the album.